I shoot with a Canon 5D Mark III. It’s a full frame professional camera. Basically, the camera of my dreams. I love it. It’s what I use when I go out and shoot. All those great wildlife and landscape photos are taken with that beauty. If they don’t come out I have no one to blame but me. I do own a point and shoot… I’ve had many over the years. And I love these little cameras. I carry them with me everywhere. They are super handy to take my food pix, street photos, and inside restaurant / building pictures. I carry them with me on trips and always have them handy in my pocket. Great little camera to have. I have had the Panasonic Lumix or some decedent there of… but my last 2 have failed on me within 2 years, so I’m a bit squeamish of buying another Lumix. My last one admittedly was probably my fault… I wore it on my belt loop on my ATV (quad) and it got ‘dusted’ on the dirt roads. When I went to turn it on, the lens wouldn’t come out. I probably got a bit of dirt between the lens and got it stuck. But my latest one, my Lumix ZS19 has me frustrated. It gave up the ghost in a puff of steam. This is the last picture it took. 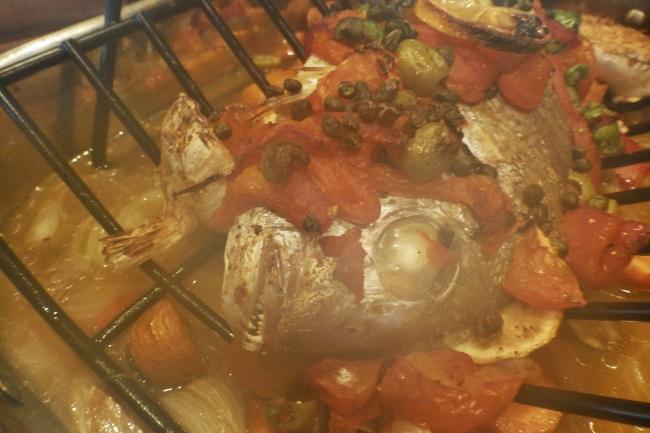 I think I scared the ghost out of it when it saw the teeth on this whole red snapper. (krittersmenu.com) Ha! In a puff of steam, the camera shut down and I have not been able to resurrect it. It’s 2 years old. I can’t believe a little steam would make it go belly up. I have had it ‘soaking’ in rice for 2 days, and still it won’t work. So it’s time for a new camera I guess. 1. Social Media Cameras – These camera have Wi-Fi, GPS, and can instantly send your pix to Facebook or other social media. Cameras such as the Samsung Galaxy are king in this field. Not my area of expertise however. I don’t participate in Social Media, don’t have a Facebook account, and barely can spell Twitter. Thus this category is not for me. 2. Inexpensive Bargain Point & Shoots – There are more cameras in this field than I can list… cameras like the Canon ELPH and Nikon Coolpix, etc. These cameras are good value, good all around cameras, and do a great job supplementing a camera phone. 4. Pro Digi-cam – High end point and shoot. This is the segment I found myself repeatedly coming back to. The thing that is of No. 1 importance to me personally, is photo clarity…. particularly at low light conditions. That basically means I want a large sensor (more clarity) and large aperture (f1.8 or so) to let more light in at low light. I have come to find out that you have to sacrifice zoom for clarity. Any super-zoom will never have the clarity of a pro digi-cam. Check out the link below… it’s an eye opening example of ‘clarity’ comparison. While I like my super-zoom, if I have to give up super-zoom for clarity… then so be it. I want sharp clear photos. In looking for a new camera, there are SOOOoooo many out there, you just have to analyze and understand what is important to you, then find the camera that fits in that segment (a time consuming task to be sure, as everyone finds something different is important to each individual). I find that the sorts of photos I take with my point and shoot are street scenes, food, restaurant photos. If I do take a super zoom pic, it’s usually not good enough (or sharp enough) to do anything with anyway. If I really want to take an ‘award winning’ photo, it’s likely to be with my big camera. So I have picked my category. So now on to picking the camera. There are a lot of high end pro digi-cams. Canon G7 and Sony RX100 rock the scene with a full 1″ sensor. OMG. But the price tag for such a camera is around $800. That’s a bit steep for my little supplemental point and shoot (P&S). I have my big camera for the heavy lifting. I just want a small P&S that takes good pix when I’m out and not carrying the monster. So below those is a field of 1/1.7″ sensor camera’s that have large aperture f1.7… Canon S120, Lumix LF-1, Sony RX100 (basic), Nikon P340. They each have their individual features… but sit in the same general space +/- $100. The Sony RX100 is a bit pricey at $500 (and upward from there). The Lumix LF-1 has a view finder, but tends to be soft (blurry) in the corners (and I’m still mad at my Lumix, not sure I can stomach another one). That leaves me with the very capable Nikon P340 and Canon S120. Being a Canon owner, I tend to lean toward that. The Canon S120 is super small (that can be good or bad), but gets great reviews in particular regard toward clarity… the feature most important feature to me. It only has a 5x zoom, which is going back years on my ‘zoom’ front days.. but I may be making the plunge. Hmmmmm….